Please pray for a quick resolution of this crisis in the Archdiocese of San Antonio which has significantly disrupted the parish life of the members of Our Lady of the Atonement Parish. The EWTN World Over News program covered the crisis at Our Lady of the Atonement parish last Thursday on January 26th. It’s an embarrassment to Catholic in the San Antonio archdiocese to see such coverage on national Catholic news. View EWTN news segment on the crisis at Our Lady of the Atonement. Starts at approx. 10 minutes and 55 seconds. Our Lady of the Atonement, intercede for us! “As more information becomes available, we will share it with you. Fr. Phillips has been removed from the parish grounds for the next 15 days and cannot respond to any contact from parishioners or school families. “We were notified today of the canonical process being initiated by the Archdiocese to remove Fr. Phillips as the pastor of Our Lady of the Atonement Parish as well as the head of The Atonement Academy. The Archbishop stated that Fr. Phillips has done nothing wrong, yet claims his ministry is detrimental to the faith of the people and keeps the people of the parish separate from the communal activities of the archdiocese. “Please pray for God’s will to be done. Fr. (Christopher George) Phillips, who turned 67 last month, grew up a Methodist in Connecticut. He studied sacred music, biblical studies and philosophy. He is also an accomplished church organist and composer of hymns. While in college, he was converted to The Episcopal Church and pursued the Episcopal priesthood, eventually ending up in England to continue his theological studies. It was in England that he became an ordained Church of England cleric. Upon returning to the United States, he was received into the Episcopal Diocese of Rhode Island and served as a simple parish priest. However, changes were happening in The Episcopal Church which did not set well with Fr. Phillips and he eventually became interested in the Roman Catholic Church and its unshakable doctrines. In 1980, Pope John Paul II, responding to the cries of Episcopalians and Anglicans seeking to reunite with the See of Peter, issued the Pastoral Provision which provides for Anglican and Episcopal priests to resign their Orders, become fully-fledged Roman Catholics, and eventually recapture their priesthoods as Catholic priests. The Pastoral Provision also provided an opportunity for converting Anglicans to retain the richness of their Anglican ethos, patrimony, hymnology, worship and parish life. Fr. Phillips jumped at the chance. In early 1982, he renounced his Anglican Orders and moved with his growing family to San Antonio. A year and a half later, now Mr. Phillips, again became Fr. Phillips as he was ordained into the Catholic priesthood by Archbishop Patrick Flores (IV San Antonio). The newly-minted Catholic priest got involved in helping to develop the new Anglican Use liturgy. He went to Rome and participated in the Vatican’s Liturgical Commission’s work to develop an Anglican Use liturgy. The result of his efforts was the 2003 publication of The Book of Divine Worship, which contains elements of 1928 and 1979 American editions of the Book of Common Prayer, as well as the 1970 Roman Missal. A new liturgical expression was born in the Catholic Church, one with an Anglican accent. On August 15, 1983, Our Lady of the Atonement Catholic Church was erected by papal authority as an Anglican Use parish and with the cooperation of Archbishop Flores. 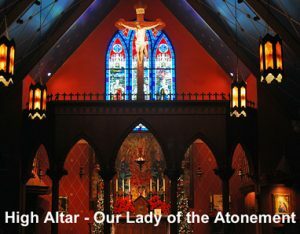 Our Lady of the Atonement is the first Anglican Use Pastoral Provision parish in the entire world and the mother church of Anglican Use in the United States. Our Lady of Walsingham Church in Houston was quick to follow the footsteps and shadow of Our Lady of the Atonement. OLW is now the cathedral for the American-based Personal Ordinariate of the Chair of St. Peter. It is one of three Anglican ordinariates (jurisdictional entities) in the world, along with the Personal Ordinariate of Our Lady of Walsingham in England and the Personal Ordinariate of Our Lady of the Southern Cross in Australia. From the humble beginnings of 18 souls, some of whom were Fr. Phillips’ wife and children, Our Lady of the Atonement grew, and grew, and grew, and grew and is continuing to grow at an explosive rate. For the first few years, OLA had no permanent edifice. By 1985, church members learned that the diocese had a six and a half acre plot of land which was sitting unused — a home to rattlesnakes and scorpions. But, because Our Lady of the Atonement was a unique personal pastoral provision parish and not a diocesan territorial entity, the growing Anglican Use congregation had to purchase the land from the Diocese of San Antonio for $83,000 in order to put down permanent roots. In celebration of his10 years as a successful Pastoral Provision parish, Fr. Phillips decided it was time to build a topnotch Catholic school — the Atonement Academy. The school first opened its doors to 66 Kindergarten through Third Grade students on Aug. 15, 1994. Since Day One, the school has been bursting its seams and Fr. Phillips has not been able to build fast enough to accommodate its phenomenal growth. Ground was broken in 2013 for a massive three- story structure to augment the present school and allow for Atonement Academy to eventually be home to 800 students, while providing them with a gigantic gym, additional classrooms, fully equipped labs, a full theatre, an auditorium and concert hall. Fr. Phillips says he wanted to build a structure large enough that the school would grow “into” it rather than “out of” it as soon as the building was blessed and the ribbon was cut. Fr. Phillips and his church found favor with Archbishop Flores and his immediate successor, Archbishop Jose Gómez , who is now the Archbishop of Los Angeles. San Antonio’s Auxiliary Bishop Oscar Cantú also embraced Our Lady of the Atonement and her Anglican Use pastor and his ways. Bishop Cantú is now the II Bishop of Las Cruces. Finally, in 2010, the then auxiliary Bishop of Chicago became the 6th Archbishop of San Antonio. The episcopal support slowly soured and the fraternal relationship between the priest and his Archbishop became strained. The new Archbishop had no experience with Anglican Use parishes and he issued his chilling letter just 10 days after Archbishop Flores died. Other early Anglican Use Texas parishes are in Houston (Our Lady of Walsingham) and Arlington (St. Mary the Virgin). When the new bishops in the Archdiocese of Galveston-Houston and the Catholic Diocese of Fort Worth inherited their respective Pastoral Provision parishes, they accepted their uniqueness and did not try to change them nor interfere with their Anglican-style ethos, patrimony, worship and parish life. Bishop Steven Lopes (II Chair of St. Peter Ordinariate) recently explained on a Canadian Salt + Light Catholic television program the distinctiveness of the Anglican Use liturgy, patrimony, and parish life with the priest. That distinctiveness not only is visible in the celebration of the liturgy, but it also flows down through and into the parish life and how the parishioners interact with their priest. Fr. Phillips has a commanding presence. He usually is seen wearing a flowing black cassock while making his rounds around the church and school grounds. He speaks with a booming baritone voice, yet is very tender and fatherly in dealing with his parishioners and students. He celebrates the Eucharist with energy, passion and deep devotion and teaches with power and authority. The genteel priest knows the names of each of his nearly 600 school children, whom he sees on a daily basis. Even before the first note was sounded on Jan. 22 (the first Sunday after Fr. Phillips was sent on reflected leave), Fr. Martin Leopold, the moderator of the curia for the Archdiocese of San Antonio, presented Archbishop García-Siller’s case before the people of Our Lady of the Atonement. Fr. Leopold tried to assure the OLA parishioners that the Archbishop recognized the beauty and truth of the parish and that he recognizes that Our Lady of the Atonement is a place of deep reverence, a place of beauty, a place of doctrinal clarity and a close-knit community. The visiting priest said that Archbishop García-Siller considers the Pastoral Provision and the Anglican Use liturgy a blessing in the Archdiocese of San Antonio and, as Archbishop, he is willing to continue to protect and foster it. However, Archbishop García-Siller has sent Msgr. Frank Kurzaj to Our Lady of the Atonement as parish administrator. In fact, on the Archdiocesan website, Monsignor Franciszek Kurzaj, VF, is already listed as OLA’s administrator and Fr. Phillips’ name has been scrubbed and there are no other OLA clergy listings, including that of Fr. Jeffrey Moore as curate; and Deacon Michael D’Agostino. However, Fr. Phillips is still listed as pastor on the OLA website. The newly-placed parish administrator, Msgr. Kurzaj, is a Polish-born, Latin Rite Catholic priest who is currently the pastor of Sacred Heart Church in Floresville, Texas. The church, which is an hour away, also has a small attached parish school which has fewer than 60 Pre-K to Grade 5 students. Fr. Leopold explained that the parish administrator was put in place to maintain the life of the parish. When Fr. Phillips was ordained by Archbishop Flores on Aug. 15, 1983, he promised obedience to Archbishop Flores and to all of his successors. Archbishop García-Siller is a successor, so Fr. Phillips is in humble obedience to him and, as such, he is in now incommunicado while he goes into prayer and reflection as requested by his Archbishop. Our Lady of the Atonement Catholic Church is still an Anglican Use Pastoral Provision congregation with hopes of eventually landing safely in the Houston-based Personal Ordinariate of the Chair of St. Peter with all its buildings intact. In 2012, when the American ordinariate was first erected, Fr. Phillips took a church wide census survey of his parish to determine those who were interested and eligible to become a part of the Ordinariate. At that time it was revealed that there were 408 family units. (The Catholic Church counts membership in terms of households or family units rather than baptized, confirmed and communicant numbers.) Of those households, an overwhelming majority 272 households or 67% were eligible for Ordinariate membership by virtue of their Anglican DNA or other similar links. Another 33% or 136 households choose OLA for its Anglican Use style of worship, but are not eligible to become canonical members of the Ordinariate. A person can canonically be a member of an Ordinariate parish without being a member of the Ordinariate itself. Any Catholic can attend any Anglican Use liturgy and any member of the Ordinariate can attend any Roman Catholic Mass. Currently there are 68 Ordinariate priests serving 43 worshiping Ordinariate of the Chair of Sat Peter communities. In addition, there are about 8,000 souls in the Ordinariate. However, since a person can be a member of an Ordinariate church without being a member of the Ordinariate itself, the ASA figures are higher than the actual membership figures reflect. A correlating survey of Atonement Academy also revealed that the then 547 member student body was made up of 336 students (62%) who were already members of Our Lady of the Atonement Church, while another 157 students (28%) were from other area Catholic worship communities or members of other denominations or even “nones”. The remaining 54 students (10%) were international scholars who had heard about the Academy and chose to come for the quality of its classical Catholic education, which includes learning Latin, experiencing the literary classics, singing liturgical choral music, exploring the fine arts and being deeply immersed in age-appropriate theology including active participation in daily Mass and a full Sacramental and prayer life while at school. Several Ordinariate parishes have made the transition from Catholic or Anglican dioceses and kept their property. In Houston, Daniel Cardinal DiNardo (IV Galveston-Houston) quick claim deeded Our Lady of Walsingham to the Ordinariate for mere $10. In Arlington, Bishop Kevin Vann (III Fort Worth – RC) released St. Mary-Virgin to the Ordinariate without a fuss. In Omaha, St. Barnabas had to pay an undisclosed amount to the Episcopal Diocese of Nebraska to bring the 100-year-old English Herefordshire-style church into the Ordinariate. In Orlando, Florida Traditional Anglican Communion Bishop Louis Campese (ACA – Diocese of the Eastern United States) joined the Ordinariate and brought his parish flock and Incarnation Cathedral with him. But it appears that Archbishop García-Siller has different ideas, and it is the understanding of OLA parishioners that the Archbishop’s removal of their priest and substituting him with Msgr. Kurzaj is the first step in making Our Lady of the Atonement “a territorial parish with perhaps one Anglican Use liturgy per week” thus ignoring the well-defined dictates of OLA’s 1983 erection paperwork. In the1983 Code of Catholic Canon Law, Archbishop García-Siller is apparently using Canons 1740 and 1741 dealing with the Removal of Pastors, in dealing with Fr. Phillips and his Anglican Use parish. “When the ministry of any pastor becomes harmful or at least ineffective for any cause, even though no grave personal negligence, the diocesan bishop can remove him from the parish” Canon 1740 states. OLA members are not taking what they see as their Archbishop’s clandestine takeover of their parish sitting down. A saveatonement.org website has been established to keep parishioners abreast of breaking news and events. There is an accompanying #saveatonement Twitter account. Charles M. Wilson, one of the original 18 members of OLA when it was erected, and the founder and chairman of The St. Joseph Foundation, an organization designed to “Defend Catholic Truth and Uphold Catholic Rights” has stepped in to provide Our Lady of the Atonement and Fr. Phillips with Catholic canonical law expertise. A meeting has been planned with an experienced canon lawyer, Thursday evening (Jan. 26) to help distraught OLA parishioners wade through the ramifications facing them. The meeting which has been called to “provide information to the parishioners about the situation involving their church and pastor” is to be held at a neutral site away from Our Lady of the Atonement property. Parishioners have been advised not to bombard Archbishop García-Siller with letters, but to rather to let the powers that be … know in Rome. Our Lady of the Atonement, as a Pastoral Provision parish with a strong interest in going in to the Ordinariate, is under the auspices of the Congregation of Doctrine and the Faith (CDF) in Rome. The CDF is a curial office. Not much can happen with a Pastoral Provision or an Ordinariate parish without the CDF’s approval. Ultimately, the CDF will have to rule on Archbishop García-Siller’s actions, since Our Lady of the Atonement is under papal authority and both sides, including priest and Archbishop, will have to abide by the ruling — whatever it is. The Ordinariate’s Bishop Lopes was the personal aide to William Cardinal Levada then Prefect for the Congregation of the Doctrine of the Faith when Anglicanorum Coetibus was first released calling for the creation of “personal ordinariates” to satisfy the needs of Anglicans seeking unity with the See of Peter while keeping their Anglican accent. Cardinal Levada’s successor is Gerhard Cardinal Müller and, as a former CDF staff member, Bishop Lopes has Cardinal Müller’s ear and it is known that the Congregation of the Doctrine of the Faith is involved in the developing problem at Our Lady of the Atonement. Members of Our Lady of the Atonement are not just relying on CDF to respond, they have mounted a prayer campaign for their beleaguered pastor. A nine-day novena to Pope St. John Paul II has been started, asking the recently sainted pope “to intercede for Fr. Phillips and the church of Our Lady of the Atonement …” Pope John Paul II was the pontiff who established the Pastoral Provision and signed off on the erection of Our Lady of the Atonement as an Anglican Use Pastoral Provision parish within the Archdiocese San Antonio. Fr. Phillips personally knew Pope John Paul II during his lifetime. In addition parishioners are seeking Our Lady of the Atonement’s intercession. 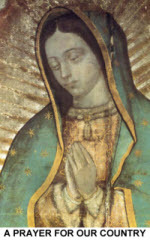 Our Lady of the Atonement is one of the many names by which the Blessed Virgin Mary is referenced. It, along with Our Lady of Walsingham, is classically an Anglican way of honoring Christ’s earthly mother. The Anglican title of Our Lady of the Atonement crept into the Catholic Church through the Society of the Atonement, an Episcopal Franciscan order of friars and nuns who, influenced by the Oxford Movement, eventually became Roman Catholics in 1909, and brought their devotion to Our Lady of the Atonement with them. My mother is very fond of Fr. Phillips. She drafted him to say his first Mass for CTSA when she was scheduling celebrants many years ago at Mount Sacred Heart. Fr. Phillips, though married, is a full time pastor, consummately devoted to the life of his parish and school – a good shepherd. The Archdiocese is acutely aware of the parishes that have pastors that, though assigned full time, have other outside committments, are hirelings, yet does not effectively intervene to shepherd those flocks. The Archdiocese is acutely aware of priests that are in dire need of language training so they can be understood, yet it does not require it. Praying for Fr. Phillips speedy return to OLA and his ministry and that the Archdiocese get about the business of the Gospel. How generous, once this “take over” of our Anglican Rite Church is complete, by Archbishop, Garcia-Siller, we will be allowed to have, one time a week, an Anglican Rite Liturgy Mass. What a travesty! Some say “it’s God’s will”, no it’s AB Garcia-Sillers will!! Here is an Anglican Rite Church 30 years plus at this same site, now with a large congregation and a K thru 12 school! What a plum “acquisition” for the Archdiocese. And Father Phillips, the Spirit behind it all, gone, evicted from the property, not allowed contact with his parishioners or to enter the Academy or his Church to say Mass. Our Lady of The Atonement Catholic Anglican Rite Church has nurtured the faith of so many with it’s beautiful reverent, Liturgy, music, choir, most importantly kneeling at the alter to celebrate the Eucharist. What a loss to the faithful of this church and to the community.Our Lady of the Atonement Catholic Church is a beautiful and unique jewel, celebrating the Anglican Rite. If the Archdiocese(Garcia-Sillers) accomplishes this “takeover” the buildings(body) of the church will remain the HEART will be gone!